Look around your space how much of what you are looking at right now at this moment is real? I’m looking at beautiful watercolors of Venice and Florence. The paintings are of real places but they are art. An artist interpretation of what his eye saw. There is a stack of magazines on the floor, newspapers, ads. They are filled with supposed “real” people. But they aren’t real. They have been styled, made up, airbrushed, posed. They have been turned into art by the photographer stylist, designer. They are real things presented as an interpretation of that persons idea of perfect yet they are sold to us as reality. I want my daughters to know real. We protect them from a lot. We don’t have cable. My women’s magazines are kept hidden and we don’t get Victoria’s Secret catalogs. They watch princess movies yes, but that is as far as Disney penetrates our house. There is no Glee, no High school Musical, no pop music. We are currently doing our best to keep Barbie at bay. We have been called prude told we are sheltering our children. Shelter I will, for as long as I can for I want my daughters to know what Real beauty is, what real women look like. That was my five minutes but I have more to say. Casey is amazing. She is brave and beautiful and she bared her soul and belly over at Babble to help our girls, our society see that real women don’t strut down the cat walk weeks after having babies. It's easy to beat ourselves up, especially as new first time moms. You don't see other's flaws only their perfections. We see snippets of moms and celebrities online, and they seem perfect. We compare our worse to their best. It's easy to believe that the painted picture of perfection is reality. Reality is messy and broken and scratched and stretched, scared and healed. That belly created beauty that surrounds me every day with little hands and hearts and sweet baby kisses. That my daughters will know that this is the reality of motherhood and it is beautiful . You are so awesome!!! And by posting this your daughter will ALWAYS know that being REAL is what's most important, being true to themselves. 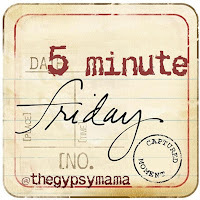 I can't WAIT to link up for Five Minute Friday ... this topic has been floating around in my head for a LONG time. Life is ALL about being real otherwise you are cheating yourself and those around you. Your crediablity is lost when you hide who you really are. Thanks for bearing your "soul" my love...You ROCK!!! As a mommy to a two year old girl, I find it very important to promote healthy self image because of the struggles I myself have gone through. Girls need good, godly, womanly examples! I love your courage and passion to raise your daughters to appreciate real truth and beauty. This is a beautiful post! "It's easy to believe that the painted picture of perfection is reality." I love this. We've never had cable in our home either. It's so important to teach our girls ~ and our boys ~ what real beauty is. Standing and applauding - I pray my daughter knows that kind of real womanhood too! oh yes. The beauty that is a body lived...of love valued. what wonderful things to teach your daughters. Raising girls is a hard job, but it sounds like you are doing great. They are lucky to have you! So very brave of you. And beautiful. And real. I love this line "we compare our worst to their best" - it's so true, and possibly the worst and most persistant thing we do to ourselves: constantly trying to seek our own validation by comparing our private selves to some public other. It's so defeatist, but we do it incessantly. Brava to you, for having the courage to bare yourself and proclaim "I am beautiful" for truth is more beautiful than any airbrushed page in a magazine. The former fills us. The latter should line our waste bins. BEAUTIFUL! You and your words both, just beautiful! LOVE it! I could not have said it better myself. All our daughters and our sons need to see real beauty! Great post.